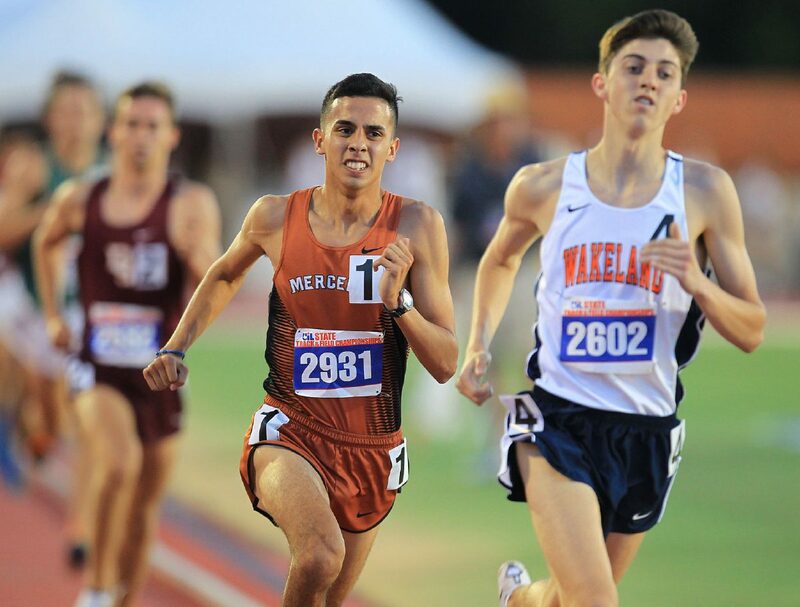 Mercedes's Dominic Cavazos (1), center, competes in the 5A 1600 meter run during the UIL State track meet at at the University of Texas-Austin in Mike A. Myers Stadium on Friday, May 11, 2018 in Austin. The Rio Grande Valley traditionally brings in a strong medal haul at the UIL state track and field meet, and the 2018 season was no different. But only two athletes will be able to boast the title of Girls Track and Field Athlete of the Year and Boys Track and Field Athlete of the Year. Edcouch-Elsa's Bianca Cardenas reacts after she cleared 13 feet in the girls pole vault during the 31/32 Class 5A Area Track Meet Thursday, April 19, 2018, in Edcouch. La Joya Palmview's Brianna Robles crosses the finish line in the girls 1600-meter run at the Class 6A Region IV Track and Field Meet Saturday April 28, 2018 at Alamo Stadium in San Antonio. Mission High's Alex Cordova competes in the 6A 400 meter run during the UIL State track meet at at the University of Texas-Austin in Mike A. Myers Stadium on Saturday, May 12, 2018 in Austin. 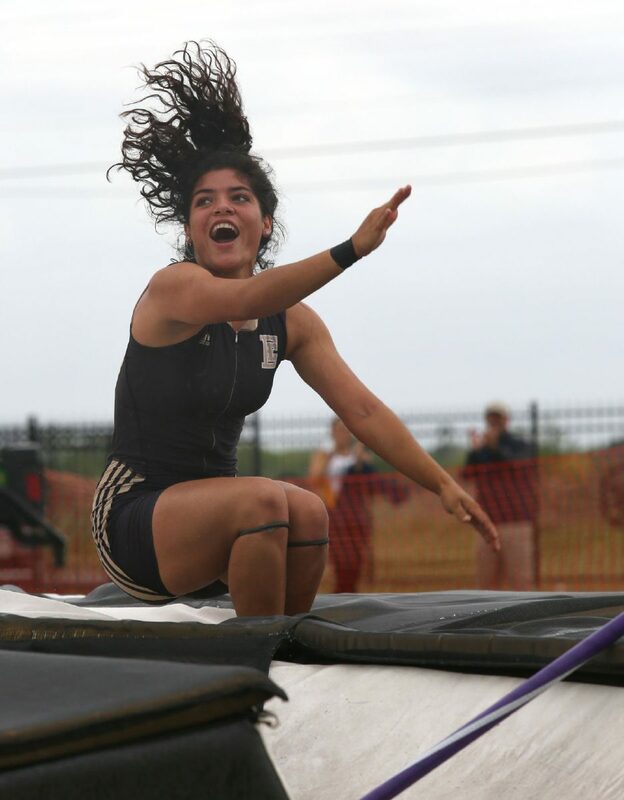 >> Bianca Cardenas, Edcouch-Elsa: Cardenas had a breakout year in the pole vault. She set personal records four different times and became the first girl to reach the 13-foot plateau in RGV history. Along with her stellar pole vault performances, the junior finished second in the 100 dash at the District 32-5A meet. She also earned third in long jump and was a part of two relays teams: the 400 group that won an area championship and the 800 quartet that took first at the district meet and second at the area meet. >> Luisa Cruz, Los Fresnos: Cruz won gold in both the 100 and 200 at both the District 32-6A and 31/32-6A area meets to qualify for the Region IV-6A meet. The junior was also a part of the Lady Falcons’ regional qualifying 800 relay team. >> Brianna Robles, La Joya Palmview: Robles swept the District 30-6A 1,600 and 3,200 meter-runs for the fourth straight season. She also added a gold medal in the 800 with a personal record time of 2:18.87 at the district meet thanks to a new rule that allows distance runners to compete in a third event. She swept the same three events at the 29/30-6A area meet during her last run at La Joya ISD Stadium. 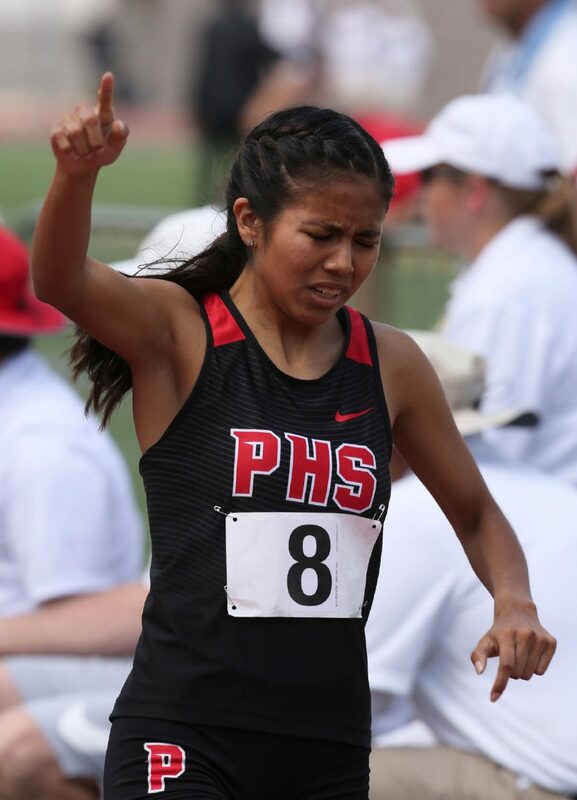 At her second UIL state track meet, she ran a 10:54.68 in the 3,200 and 5:00.01 in the 1,600 to earn sixth in both events — two spots better than a season ago. >> Andres Bodden, Brownsville Veterans Memorial: As a senior, Bodden won a District 32-5A championship in both the shot put and the discus. After district, he placed first in the discus and second in the shot put at the 31/32-5A area meet, then earned gold in the discus and a silver in the shot put at regionals. Bodden capped his season off with two medals at the state meet — a silver in the discus by throwing a personal best 173 feet, 1 inch and a bronze in the shot put with a throw of 53 feet, 6.5 inches. >> Dominic Cavazos, Mercedes: The University of Texas at Arlington commit showed why he was a Division I target. Cavazos was a district, area and regional champion in both the 1,600- and 3,200-meter runs. He finished fifth at the Texas Relays 3,200 and set a personal record of 9:19.61. In the Class 5A state 3,200 race, he took sixth with a time of 9:40.19. He was disappointed with the run but improved in the 1,600 that evening, reaching the podium and winning his first state medal, a bronze, with a time of 4:18.32. 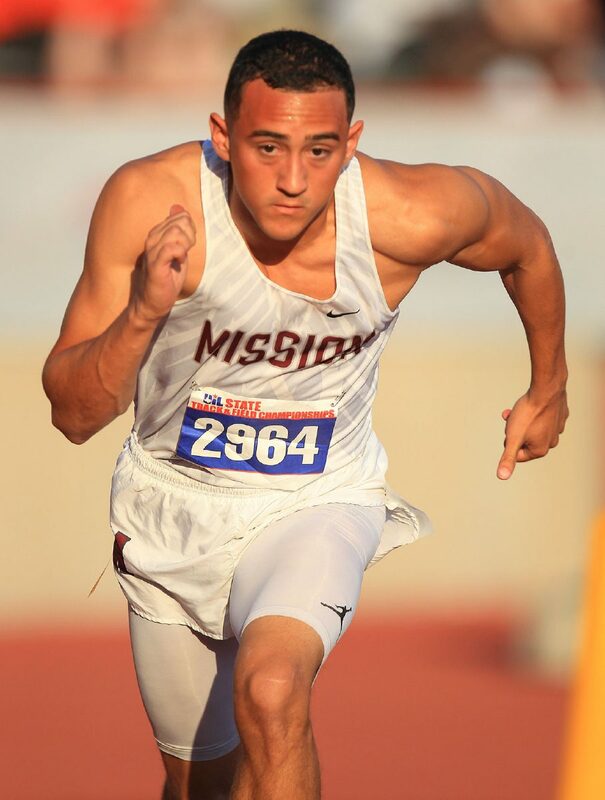 >> Alex Cordova, Mission High: Cordova spent much of the season as the Valley’s best 400 and 200 runner. His speed put him in the final heat of the regional meet in the 400, where he was just edged out for a gold with his run of 49.10. He was the Eagles’ lone representative at the state meet, where he ran a 49.15 and finished seventh.